Bolpur-Santiniketan is the major industrial centre of Birbhum, where the handicrafts and cottage industries have been extremely popular. Local women and children have always been engaged in handicrafts. The exquisite crafts of the region which are manufactured by the villagers are sold through their small shops in unorganized formats. They have their shops at Bhuvandanga – the main market of the town. Most of the retailers here are below poverty line and these shops are the only source of income for them. The organized formats include retail stores like Alcha, Amar Kutir etc. Sonajhurir Haat is situated along the canal of Mayurakshi River after Shyambati in Khoai forest, within the wide landscape full of tall Sonajhuri trees and red soil, which is a valley of uneven red soil and beautiful trees (Sonajhuri). 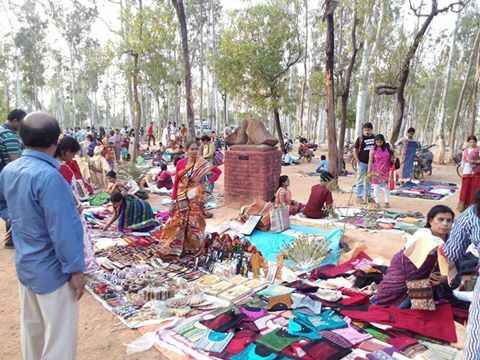 The Haat is organized on Saturdays from 3 pm to dusk. Although, artisans also sell their products on other days. They sell their products, sitting under trees with products ranging from kanthas, chic and ethnic jewellery, home decor items, paintings, wooden ornaments to green vegetables. The tranquil ambiance is enhanced by live performances of Bengali folk music by the Bauls. Working Hours : Showroom opens throughout the year except 5/6th June; From 8 am to 6pm. The walls are made up of the mud highlighting the rural look. Their product categories include bags, kurtas, sarees, leather accessories, light jewellery, organic food, organic cosmetics, upholstery etc. Other than these, there are so many shops beside Santiniketan Road & within villages where you may get even better deals.